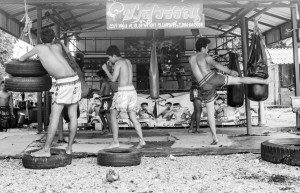 This collection of photographs is a reflection of Muay Thai, a martial art form which descended from what is now known as the Kingdom of Thailand over a millennium ago. Muay Thai uses the body to mimic the weapons of war. Hands act as the sword and dagger. Shins and forearms are hardened in training through a process referred to as cortical remodeling, thus becoming the armor to protect one against blows. The elbow becomes a heavy mace or hammer; the legs and knees become the axe and staff. The entire body is meant to operate as one all powerful unit. Muay Thai is notably alluded to as “the art of eight limbs,” and its popularity has grown immensely in the past century. Modernization of Muay Thai by King Rama VII (r. 1925-35) transformed the sport by systemizing rules and regulations. In 1995, the World Muay Thai Federation was founded and later established in Bangkok. There are now thousands of gyms spread all over the globe. Presented in my collection are two Muay Thai camps: Poonsawat Camp, which is located in Tha Sala, Thailand, and Camp Sitawee, which is located in the southern district of Nakhon Si Thammarat, Thailand. Poonsawat Camp is led by Bao Witoon, a passionate boxer who trains anyone interested in the sport completely free of charge. He has run the camp this way for the past 10 years and believes that seeing his students healthy and drug free is payment enough. Witoon trains fighters to a certain skill level before sending them off to train with professionals in Bangkok. Camp Sitawee, on the other hand, is led by Narong Komsaman, an elderly boxer who has actively engaged in the sport for over 50 years. Students pay between 500-1000 baht per month to train with Komsaman who has run Camp Sitawee for the past 30 years. Unlike Witoon, Komsaman teaches Muay Thai primarily for the history and culture of Thailand. These photographs are presented in an order which I deemed most appropriate.